"Nothing more than wild conjecture based on erroneous and stale information." Federal prosecutors are asking that convicted Alaska legislator Vic Kohring's request for a new trial should be denied due to false information supplied to the court by Kohring's showboating lawyer, John Henry Browne. Kohring is trying to get his convictions on conspiracy, attempted extortion, and bribery tossed out or a new trial with a different judge due to a claim of bias. Kohring, in a motion filed Feb. 1, accused U.S. District Judge John Sedwick of bias because of what he called "an extremely antagonistic relationship" with Sedwick's wife, Deborah. Tha Anchorage Press had a story included as an exhibit in the government's filing, "Kohring's Last Stand?," published in the Press online at www.anchoragepress.com February 2. "Assuming for a moment that a 'deep animosity' truly existed between Kohring and Mrs. Sedwick in or around 1998, it is illogical and unreasonable for Kohring to suggest that he did not realize the familial relationship between Mrs. Sedwick and the assigned trial judge during the several months prior to his trial or, at the latest, when Mrs. Sedwick was reportedly in the courtroom near the end of the trial," a portion of the government's argument reads. "Kohring's 'new evidence' argument might have some air of plausibility had Mrs. Sedwick's last name been Jones or Smith, but Sedwick is a surname that is not commonplace within Alaska." The government speculates that, given Kohring's failure to file his appeal promptly, he must have known of the Sedwick's relationship from the very beginning, but that he held that "trump card," waiting until after the pre-sentence report had been written. "Such gamesmanship should not be permitted," the government's filing states. Regarding Kohring's alleged animosity with Deborah Sedwick, the government states that "Kohring, at best, has tendered only rumors, innuendos, and unsupported allegations in support of his motion." "Kohring, at best, has tendered only rumors, innuendos, and unsupported allegations," prosecutors said in their 17-page filing. Kohring's sentencing has been delayed until he rules on the question of bias. 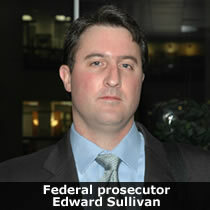 Federal prosecutors are seeking a five-year prison sentence.